Read and follow a recipe and understand that some recipes are flexible and some are specific. Connect the kitchen experience with the garden. Successfully make Kale Pesto and Lemonade. Translate kitchen skills into cooking outdoors. Maintain the same number of fingers as when they started. Teachers invite students to celebrate their last day in the garden as sixth graders. Welcome students and introduce today as their last class in the garden as sixth graders. Explain that you have designed a delicious way to celebrate and reflect on your time together in garden class over the entire school year. Divide the class into four groups: one Kale Pesto group, one Lemonade group, and two garden job groups. Students choose to either work in the garden or prepare food to eat at Closing Circle. Two groups of students will participate in garden jobs, one group will make Kale Pesto, and the other group will make Lemonade. Circle the students around the cooking area. Explain what they will be making and that they will be serving it to the rest of class at Closing Circle. Ask for student volunteers to read the recipe out loud. Allow students to volunteer for the various jobs. Prepare the dish and have it ready to serve by the end of class. 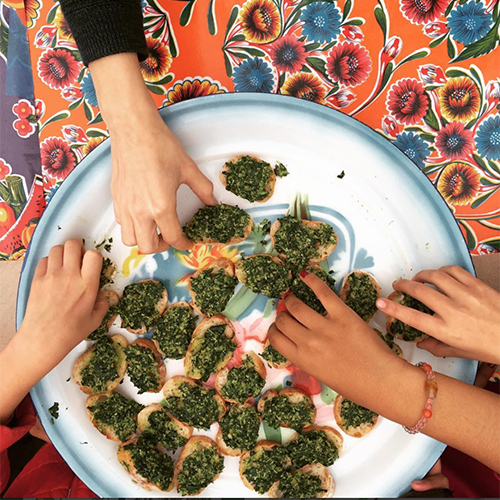 The Kale Pesto Station will slice the baguettes, spread pesto on each piece, and place them on serving trays for the end of class. Be sure to leave some slices of bread plain to accommodate everyone’s tastes. The Lemonade Station is also responsible for setting the table with napkins and a cup of lemonade for each student, teacher, and volunteer. Students celebrate their last garden class as sixth graders as they share food and conversation at the table. Have the class sit all together at the long table while select students from the Kale Pesto group serve the rest of the class. Each student may choose three pieces of bread to start and the rest (if there is any) is passed out to those who want seconds. Students and staff sit for approximately 10 minutes engaging in conversation, reflecting on their garden experience, and enjoying the delicious food. When the bell rings, ask students to bring their cup and napkin to a bus tub at the end of the table. Harvest and prepare crops with guidance, recognize the relationship between the kitchen and the garden, and learn the seed to table concept.